Hello again! When I find embellishments that I love especially the floral die-cuts that I absolutely love, I always try to think of fun ways to include on my projects! I decided to use all these die-cuts and to highlight them on my layout. I drew inspirations from my daughters' blue & white stripe dress. 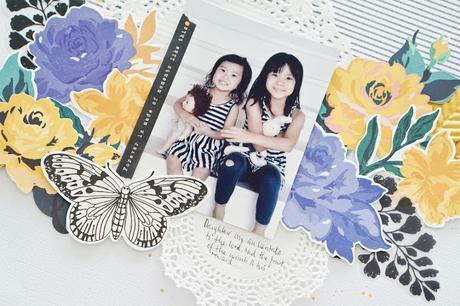 Instantly, I knew there's a stripe patterned paper in Flourish collection and just had to include it onto my page. I adhered the stripe paper at the top of the page and the photo somewhat in the middle. 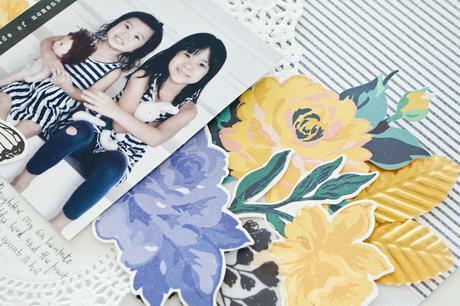 Then, I used two paper doilies to be placed at the back of the photo. 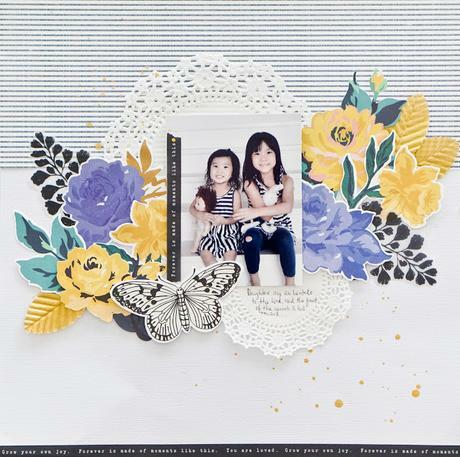 Just for the girly feel to the layout! Once that is done, I decided to use blue & yellow flowers at both sides of the photo. I really had fun arranging these flowers. Just by layering them slightly on top each other, it'd create a lush or fuller look. Adding the butterfly at the bottom just completed the overall look! 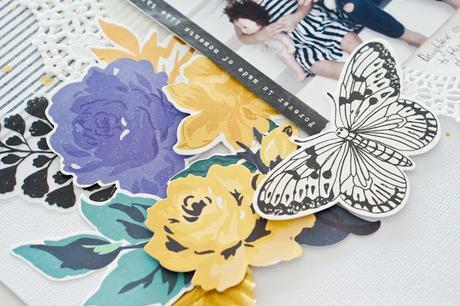 I wanted the floral die-cuts to be a main point on my page, so I kept the remaining embellishments very simple and easy. To add dimension to the floral die-cuts, I used foam dots all around. Also putting in mind that both sides are balanced too. Overall, this is a very simple, but fun layout! You could layer more or layer less according to your preferences. Thank you so much for joining me today! I hope I've inspired you to use your favorite products in an exciting way! 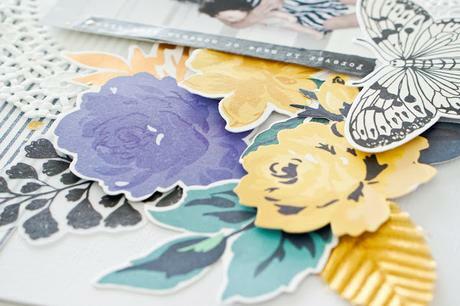 Supplies : Maggie Holmes Flourish - Home Sweet Home paper, Ephemera Die-Cuts, Washi Tapes.